Get Seksy, sassy, contemporary watch design from Sekonda. 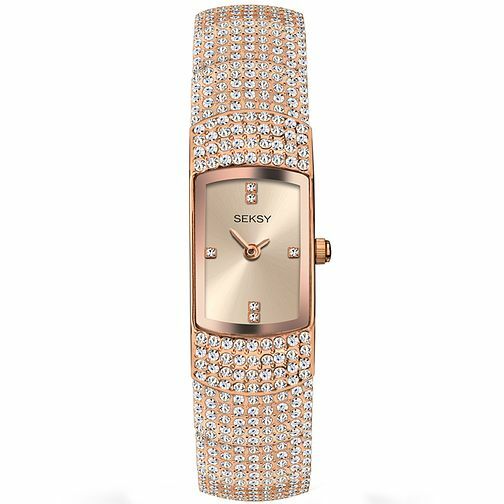 This rich rose gold-plated bracelet watch features a chic rectangular dial and is embellished with a stunning 400 glittering Swarovski® crystals for the ultimate in glamorous accessorising. Seksy Ladies' Rose Gold-Plated Bracelet Watch is rated 5.0 out of 5 by 7. Rated 5 out of 5 by Anonymous from Beautiful watch, looks amazing This watch looks good on paper but beautiful when worn. Have received lots of compliments. Would highly recommend.